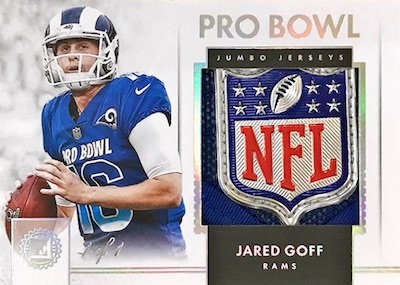 One of the many premium NFL sets these days, 2018 Panini Encased Football continues to pack hits in the five card-boxes. Now in its third season, the 2018 set has the exact same format as 2017 and 2016. Specifically, each box contains one autograph, one BGS-graded autograph, and two memorabilia cards. Of course, the fifth card in each 2018 Panini Encased Football box is from the base set, but they tend to take a backseat. Parallels include Sapphire (#/25), Gold (#/10), Emerald (#/5), and Diamond (1/1). Select veterans have limited base Autograph editions numbered to 20 or less. 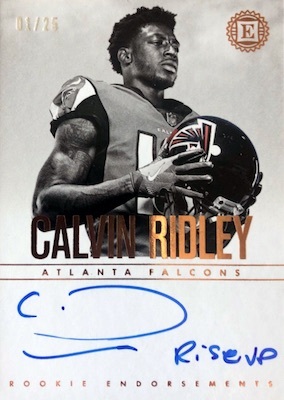 Stressing on-card autographs, the 2018 Panini Encased Football checklist is filled with rookie, veteran and retired stars. 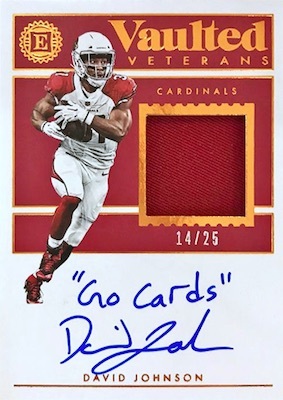 The main RPA option is the Rookie Cap Patch Autographs subset numbered to 50 or less. These cards pair a player-worn hat piece and hard-signed autograph. 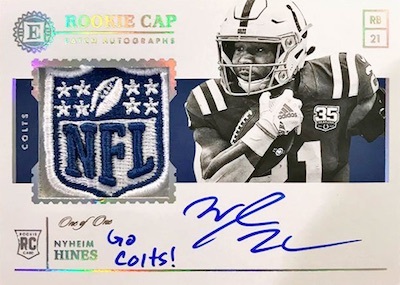 Also limited to 50 or less, first-year stars are featured heavily in Rookie Endorsements and Rookie Notable Signatures, which has full-body images. Both present rare inscription versions. 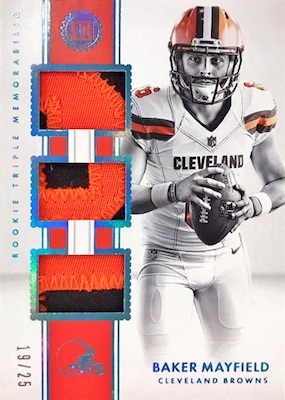 Displaying relic pieces and an on-card autograph, the Rookie Dual Swatch Signatures insert supplies limited inscribed cards, as well. 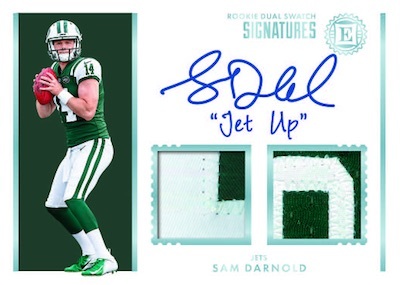 All rookie sets add Sapphire (#/25 or less), Gold (#/10 or less), Emerald (#/5 or less), and Diamond (1/1) parallels. 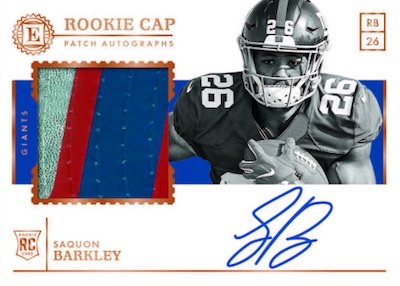 In fact, the Diamond edition boasts an NFL shield logo swatch for the Rookie Cap Patch Autographs. 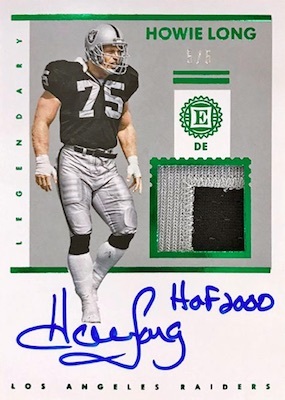 Those hunting for non-rookie content in 2018 Panini Encased Football are in luck thanks to Reserve Signatures (#/50 or less) and Hall of Fame Material Signatures (#/25 or less). 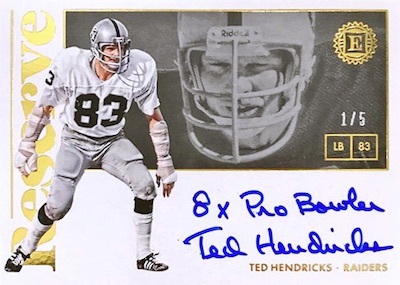 These sets feature current standouts and retired greats with inscriptions also in play. 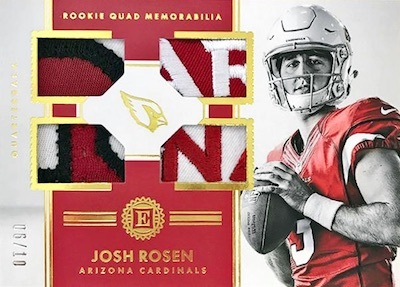 Among the relics that combine to average two per box, 2018 Panini Encased Football includes Rookie Quad Memorabilia with a quartet of swatches. While the main set is capped at 75 copies or less, there are low-numbered Sapphire (#/25 or less), Gold (#/10 or less), Emerald (#/5 or less), and Diamond (1/1) parallels to chase. DJ CHARK Jr 2018 PANINI ENCASED ROOKIE NOTABLE SIGNATURE AUTO #'RD 11 25 !! ROYCE FREEMAN 2018 PANINI ENCASED ROOKIE SCRIPTED SIGNATURE AUTO #'RD 12 50 !! Adam Thielen 2018 Panini Encased Auto GRADED 9 MINT w 10 AUTO. #20 20. Last One. View specific parallel print runs using the spreadsheet at the bottom of the page. PARALLEL CARDS: Sapphire #/25, Gold #/10, Emerald #/5, Diamond 1/1. PARALLEL CARDS: Sapphire #/25 or #/10, Gold #/10 or #/5, Emerald #/5 or #/3, Diamond 1/1. 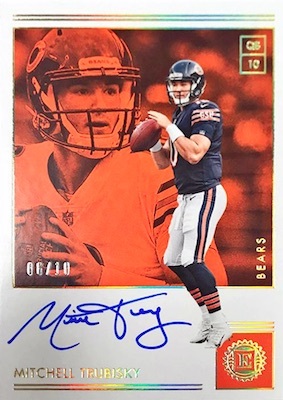 Buy 2018 Encased NFL autographs on eBay. PARALLEL CARDS: Gold #/10 or #/5, Diamond 1/1. 6 Sapphire and 6 Emerald parallels. 9 Sapphire and 9 Emerald parallels. PARALLEL CARDS: Sapphire #/25 or #/10, Gold #/10 or #/5, Emerald #/5 or less, Diamond 1/1. 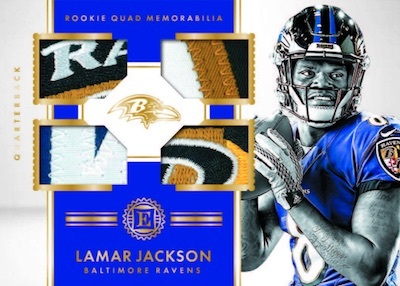 LAMAR JACKSON PARALLELS: Sapphire #/5, Gold #/3, Emerald #/2, Diamond 1/1. 15 Sapphire and 15 Emerald parallels. PARALLEL CARDS: Sapphire #/10, Gold #/5, Emerald #/4, Diamond 1/1. 20 cards. Serial numbered #/75. KUECHLY/RODGERS PARALLELS: Sapphire #/10 (No Kuechly*), Gold #/5, Emerald #/3, Diamond 1/1. 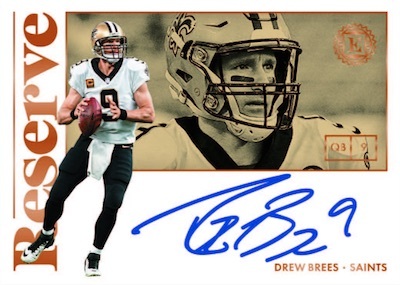 View the 2018 Panini Encased Football checklist Excel spreadsheet. No Phillip Lindsay on the checklist? C’mon!! 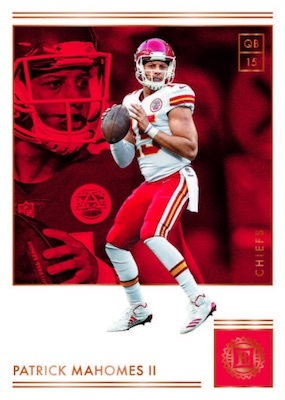 Cards are released this far after the start of the season and you dont have one of the most impactful rookies in the set? 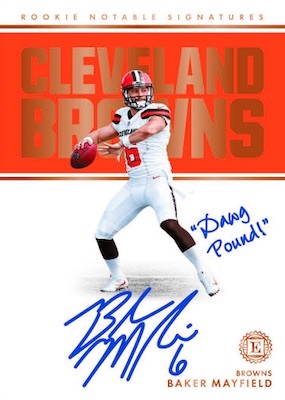 If you follow collecting Football cards… you know which products are worth spending your money on…. this aint one of them. We are supposed to take Doug Heffernin serious, watch King of Queens much. 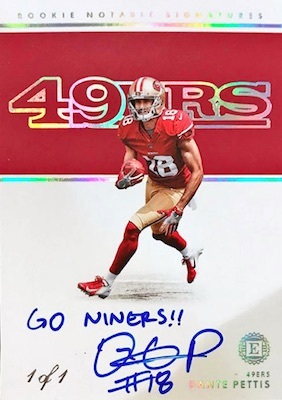 ?..Panini is definitely ruining the hobby and the bubble will burst in the next few years.. players are getting lazy with thier autos and greedy wanting to charge Panini more per auto which in hand trickles down to us consumers ..I’ll stick to collecting RCs out of blaster boxes…not being cheap, I’m not just dumb to pay $260 for a box containing $50 worth of cards..
hey we spent money to grade a bunch of these cards and get beckett to put them in slabs.. that means we can charge you way more for giving you cards you would never bother getting graded for yourself.. The one star reviewers are smoking crack, because these cards are great! And to those saying we’re getting slabbed cards that we wouldn’t otherwise get slabbed; I pulled a Brady graded at BGS 9.5. So yeah, def not a crap. There are reasons these boxes are sold out at local card shops. Clean looking cards. Great in a slab or not. The combo of studio photos with action shots is unique. Missing some key rookies though Derwin, Leighton and Lindsay. Better than flawless for sure and a fraction of cost. Yeah main rookie relics are caps not jerseys but if you can get the logo or new era piece then there are some beauts.